Multi-role combat aircraft capable of vertical/short take off and landing. Part of Joint Force Harrier, operating from land bases or aircraft carriers. Comprehensive weapons capability including bombs, rockets or missile. Can operate at night, at low level, using night vision goggles. Cockpit gives navigation and weapons information on colour displays. The Harrier GR7 is a single seat, multi-role combat aircraft that is capable of operating in extreme environments and from a wide selection of locations, including deployed air bases and aircraft carriers. The Merlin represents a quantum leap in the Royal Navy’s capability of conducting advanced, airborne, Anti-Submarine Warfare (ASW) and Anti Surface Warfare (ASuW) operations in order to optimise access to the maritime battlefield and ensure theatre entry. Three Rolls Royce Turbomeca gas turbines power it’s highly modern, aluminium composite airframe, which weighs in at a fully mission laden 14,600kg. Modular in design, its state of the art navigation, fire control, electronic warfare, communications and sonar systems make the Merlin one of the most advanced helicopters, in its class, in the world. Representing another major increase in operational capability, the Sea King ASaC (Airborne Surveillance and Control) is currently replacing the elderly MK2 AEW variant, which was rushed into service after experiences learned during the Falklands War. Powered by two Rolls Royce Gnome H engines, it offers unprecedented performance advantages over its predecessor in terms of endurance, sophisticated avionics, crew comfort and command and control facilities. With these factors in mind, as well as the airframe’s flexibility to execute various missions, the MK7 is at the forefront of delivering and co-ordinating maritime force projection. The RAF Chinook fleet performs the role of the heavy-lift element of Joint Helicopter Command and has been used extensively in recent operations in Iraq, Afghanistan, Sierra Leone and in the Balkans. Primarily used as a Battlefield Support Helicopter – it can lift up to 54 troops or carry 10 tonnes of freight (both internal and underslung) – the Chinook is equally capable as a SAR or CASEVAC platform. Powered by two Avro Lycoming turboshaft engines and armed with automatic weapons it is equally at home operating from the deck of a CVS or a roughly prepared airstrip, making it a highly versatile aircraft. In July 1995, the Apache Longbow was selected to fulfil the UK Army Attack Helicopter requirement and the first Apache entered service in January 2001with the 1st Battalion of the 227th Aviation Regiment. 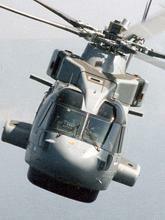 A total of 67 are on order with Initial Operating Capability scheduled for late 2004. Powered by two Rolls Royce / Turbomeca RTM322 engines, the Apache is equipped with the latest in target acquisition sensors, electronic countermeasures and precision guided munitions. The Apache weapons payload can be fully tailored for a particular mission, for example when operating in the Close Air Support (CAS) role, it can carry a mixture of Hellfire missiles, air-air missiles and cannon rounds. The procurement of a navalised version of the AH-64 is currently being considered and would significantly increase the RN’s maritime strike capability.